If you use Excel all day every day like I do, then you know it's important to have a keyboard and mouse you love. 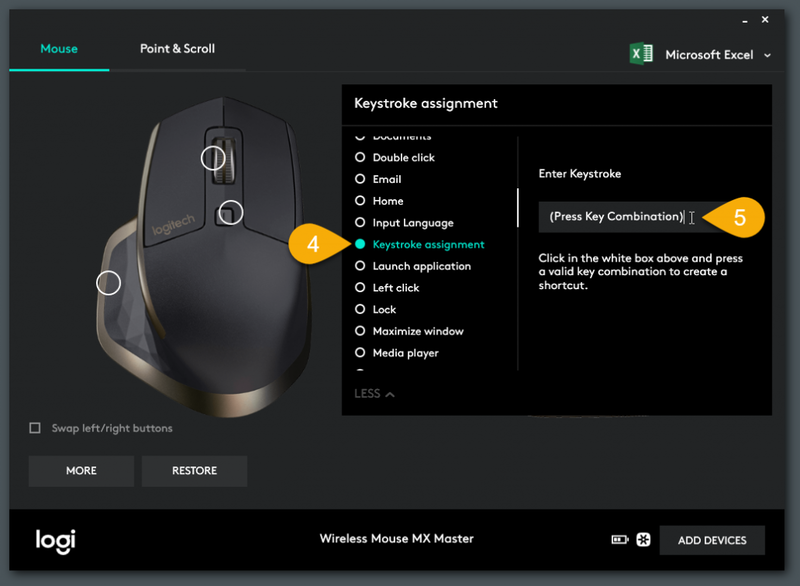 I've talked about the best keyboards for Excel before, and in this article we'll take a look at a great mouse that can help us get our job done faster. The Logitech MX Master Mouse is like the Tesla of computer mice, both in price ($67-$100) and performance. It has a futuristic look to it, and it's also packed with some great features for Excel users. The mouse has a dedicated thumb wheel for horizontal scrolling and customizable buttons that you can assign Excel keyboard shortcuts to. Yep, keyboard shortcuts on your mouse! I've been using the MX Master for over two years and I think it's a great mouse. There is also a newer version called the MX Master 2S, and I explain the differences below. Here are the Amazon links to the MX Master and MX Master 2S. Each mouse comes in 3 different colors. Beyond the futuristic look, the MX Master has some cool features that make it a great mouse for Excel. Let's take a look at each of these and see how they can help us with Excel. One of the unique features of the MX Master is the Thumb Wheel for horizontal (side-to-side) scrolling. The small wheel is located right above your thumb. You can spin the wheel up or down with your thumb to scroll left or right. A lot of modern applications and web pages have eliminated horizontal scrolling, but Excel is still one app where we need it. If you have large worksheets with a lot of columns, then you know how time consuming it can be to scroll left or right. We typically have to move the mouse cursor down to the scroll bar on the bottom of the application, or use a keyboard shortcut to find the column we are looking for. The thumb wheel on the MX Master makes for a much better “column hunting” experience. It scrolls horizontally almost an entire screen width with one scroll up/down of the thumb on a 1920×1080 screen. The only downside is that you have to remember the scroll wheel is there, and make a habit of using it. If you do a lot of horizontal scrolling while applying filters, then checkout my Filter Mate Add-in to save time with that process. The settings of the MX Master can be customized with the accompanying Logitech Options software. The mouse has 6 buttons that can be programmed. The cool part is that you can program the buttons for different applications. This is a really handy feature! For example, the mouse has the typical Back and Forward buttons. When in your web browser these buttons can be used to press the Back and Forward buttons for web browsing. However, when working in Excel, you can have these buttons navigate to the next/previous tab, undo/redo, copy/paste, or just about any action you can do with a single keyboard shortcut combination. The mouse detects which application you are working in and the customized buttons work automatically. You don't have to take any extra steps to activate them. Select Mouse from the top-left corner in the Logitech Options window. Select or add the Application (Microsoft Excel) from the top-right corner. Left-click the Forward button on the mouse diagram. Left-click in the Enter Keystroke box, then press the keyboard shortcut for the command. That's it. The mouse button will now press the keyboard shortcut. Open Excel and try it out. There are also dedicated actions for Copy & Paste. Just about any dedicated keyboard shortcut can be assigned in the Keystroke Box. If the shortcut is multi-step like Alt, A, C to clear filters, then it will not work with the mouse. However, you could assign Ctrl+Shift+L to turn filters on/off. The vertical scroll wheel on the MX Master is another awesome feature. It has two settings that can quickly be toggled with the button behind the scroll wheel. The Smooth Scrolling setting allows the wheel to spin freely. You can give the wheel a flick with your finger and it will continue to spin and scroll. This is great if you are on a really long web page, or spreadsheet. You can quickly scroll down to the bottom of the sheet. Clicking the button behind the wheel toggles the Ratchet Scrolling mode. 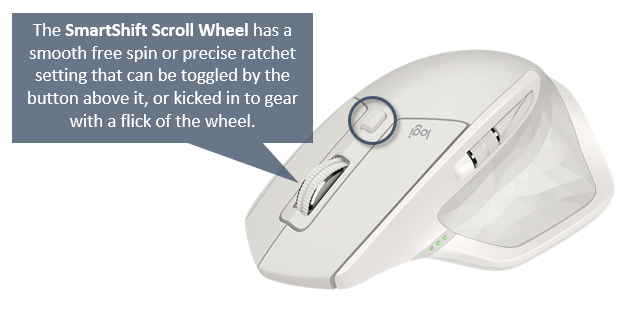 This is for more precise scrolling where the wheel clicks into place with each scroll. On a spreadsheet, the scroll only moves 2 or 3 rows at a time. The mouse also has a SmartShift feature which allows you to use a combination of both modes. You can keep it in ratchet mode for precise scrolling, and then give the wheel a firm flick and it will click into a smooth scrolling free spin. This allows you to jump down a page, then scroll precisely in the same mode. It's kind of fun, and you just have to mess with it to figure out what you like. SmartShift can be turned on/off in the Logitech Options software, and you can also set the sensitivity of how hard you need to flick to get it into free spin. The worst part about wireless mice is running out batteries right as your finishing a project and trying to get home on time. Fortunately, the MX Master has a rechargeable battery built-in. You charge the mouse with a micro USB cable (included). The mouse can be used while it is charging. The micro USB connection is on the front of the mouse, so it just looks like a wired mouse while you are charging it. I get over 2 weeks of use on a single charge, and you get a notification on your computer when the battery is running low. There are also battery indicator lights on the mouse. I also keep one of these Retractable USB/Lightning Cables in my desk and laptop case. It can charge your iPhone, Android or mouse, and makes for a great stocking stuffer! The MX Master includes a small USB wireless receiver that you can plug into your computer to connect the mouse. It uses Logitech's Unifying technology, which means you can also pair a Logitech Keyboard to the same USB receiver. The mouse has 3 memory presets for different devices. So you can connect to 3 different computers via Bluetooth or Unifying USB, and press a button on the bottom of the mouse to switch devices. Checkout my article on the best keyboards for Excel where I talk about the Logitech K270 keyboard. You can connect both the mouse and keyboard to the same USB Unifying Receiver, which helps free up your USB ports. As you can see in the pictures, this mouse has a thumb rest. It helps place your thumb in the right spot for the thumb wheel. There is also a button under the thumb rest. Pressing this button brings up Task View where you can see all the open windows on the computer. You can also perform gestures by holding the button and moving the mouse up/down/left/right. Checkout the image to see what each gesture action does. The button and gestures are completely customizable. Logitech has pre-built options for navigating and arranging windows, or even media controls like volume up/down. 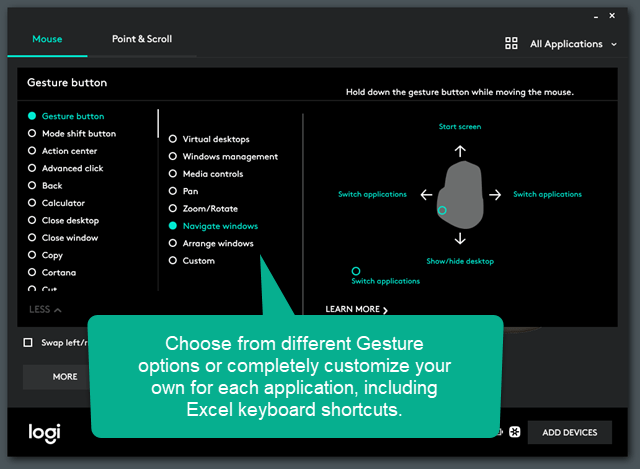 You can also completely customize these gestures, and do so for each application. That means you can create gestures for 5 additional keyboard shortcuts or actions in Excel. Of course this is going to take some getting used to, but if you are a heavy mouse user then these shortcuts could become your best friend. Both the MX Master and 2S are physically very similar. The 2S has a new Flow feature that allows you to control two computers at the same time without having to click the button on the bottom of the mouse. If you don't use 2 computers at the same time then the original MX Master is a great choice. The MX Master is currently $67 to $79 on Amazon, depending on color. The MX Master 2S can be found for $94 to $99 on Amazon. Each comes in black, blue, or light grey. Both mice are compatible with PC or Mac. Is the MX Master the Best Mouse for Excel? That's a highly subjective question. A mouse is a personal choice. I believe you have to try them to find the one that feels and works the best for you. When I first got the MX Master I didn't love it. It was a different feel from my previous mouse (the Logitech M510), and took some getting used to. But I committed to trying it for a few weeks, and now it's been my daily driver for over two years. It's a big, comfortable mouse, and the smooth vertical & horizontal scroll wheels are probably my favorite features. If you're saying, there's no way I would pay that much for a mouse, then checkout the Logitech M510 (Amazon Link). You can get that mouse for $15 on Amazon and it also uses the wireless Unifying technology to pair with my favorite keyboard for Excel. Here are the Amazon links to the Logitech MX Master and MX Master 2S. Smooth-scrolled down here to say I made to line 10122 😉 Great post and website overall, thanks! Hey Jon! Great content, very helpful tips! I am loving the Copy/paste trick. If you really want to master excel you should avoid using the mouse at all costs. It’ll make you more efficient in the long run. I agree that this is a great mouse though and I use it for my computers as well. Hi Jon, I purchased this mouse based on your recommendation. The only instructions I could find on the mouse was the instructions contained in your blog. The mouse did not come with instructions on how to program it, nor could I find instructions or an owner’s manual on the Logitech website. So, thank you for the very nicely illustrated instructions on how to program this mouse. The numerous features it comes with can be very overwhelming. I will start with a few basics and build from there. Thanks so much! Thank you for the nice comment. I apologize for the delayed reply, but happy to hear you are enjoying the mouse. I have been using the original version for almost two years, and I love it. Thank you for all the customisation hacks, they seem great ! I personnally really like the horizontal scrolling wheel. Thanks Jon, always very informative, I use the Logi M570 trackball and have found it great, I also benefit from large hands! Thanks for the suggestion Bill! Yeah I know a lot of people do the same. At one of my previous jobs most of the call center team learned to mouse left-handed so they could write and use the number keys at the same time. Do they only make right-handed ones? I use the completely symmetric Logitech M100. No bells and whistles, but does its job. Also it is not wireless, so when it burrows under my papers, which mice are apt to do, I can pull it out by its tail. Looks a great mouse, I use the Logitec G602 gaming mouse which has 11 programmable buttons. The added advantage is that it auto detects which software package you are using, it then auto switches to the macros or shortcuts that you have programmed for each button for each piece of software. Thanks Dave! Wow that is a lot of buttons! The MX Master auto detects the program you are in as well. I forgot to mention that in the article. I’m with you Jeanette. Lefties are left out in the cold. Yes, unfortunately it’s right handed only… I’m mostly left-handed too, although I write and mouse right-handed. But a left-handed version would be nice! The most important feature of a mouse is a trackball for you thumb to move the cursor instead of your hand (see Logitech M570). I would go for the MX Master if it had this feature, without it my productivity would drop drastically. Thanks for the suggestion Gary! I used to use a trackball and completely understand. Once you get used to them they are great.